If you are interested, Part 01 can be found here. The concerning was shown in judge Kanha's face the moment Nim forgot his lyrics, and came along with the wrong rhythm. The unintentional mistakes could not be forgiven this time. From my expectation, Balu should have done better than this, as he was following Khan Jame's style in singing. Judge Bayarith advised him to focus more about the quality of the voice when reaching high note. Sadly, he was not chosen to be one of the twelve. She doesn't look like 17 to me, haha. She didn't make a splendid show last night by making a minor mistake at its last part, still the judges could see the effort she had made. Her great personality in accepting advises and making improvement might also take part in leading her to this far. Good job, girl!! She was charming and entertaining on the stage, oppositely Judge Bayarith was not impressed at all as he pointed out that Yuti still has so many disadvantages in the competition. She did not make it! The show was fun and fast moving, though he has chosen an incompatible song this time. It was a great challenge for him to develop his vocal flexibility, unfortunately, his development was not yet acceptable by the judges. He was born to be a super star I guess, he is an excellent entertainer. He delivered this song remarkably even thought he tends to have favours for slow love songs. The bad inconsistency in his voice last night made a great disappointment for Judge Kanha. After all, he was given another chance to upgrade his skill for the next show. That, in a nutshell, was a flawless show from Soben, he is a talented singer. He earned a place to the next round, good job. "Failure is an adventure for continuous learning". What we saw was Undom learned from his mistake in the Theater round 2, and brought us a brilliant show this time. It was a good new impression to the audiences. There is something about Kakrai that makes the judges really like him all along. 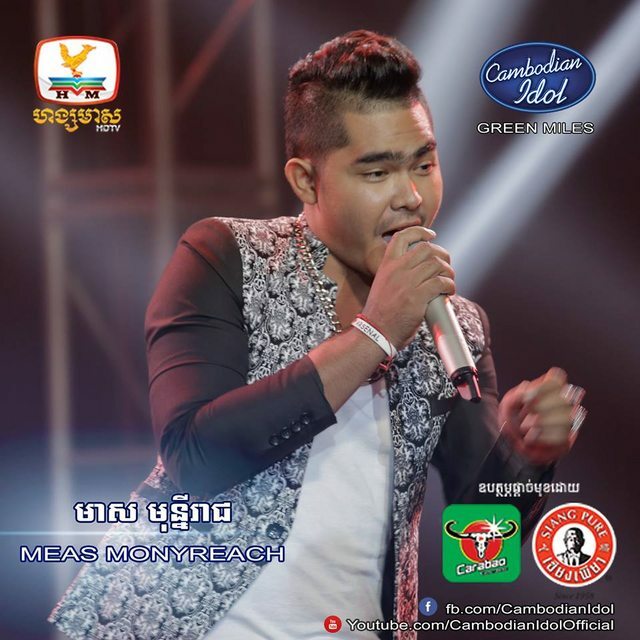 He has completed his duty on the Cambodian Idol stage very fantastically. As for Meas Monyreach, he sang professionally, and expressed himself very well to the crowd. Bolam Kakrai did not make it! I can't wait for the show next week! !